Knowledge base search control in Dynamics 365 is now powered by Relevance search. This empowers administrators to fine-tune search as per their business requirement and have their agents get the most relevant search results quickly. Relevance search leverages Azure search service and delivers the results with improved performance and accuracy. Bert is a customer service agent with Contoso travels and is working on a case where a customer is facing issue while booking a hotel. 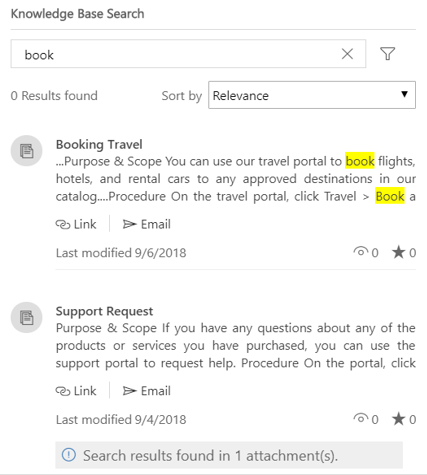 Bert looks for guidance from knowledge base and searches for ‘book hotel’ keyword and gets corresponding knowledge article results. Bert can take any further actions on the article, like opening it for complete reading or emailing it to the customer with more understanding of what the article is about. You can now tune your KB search to search a knowledge article on any OOB or custom field. For example, in this scenario Bert has more than one results for booking hotel and wants to find an article that is most relevant to the country that the customer is trying to book the travel for. 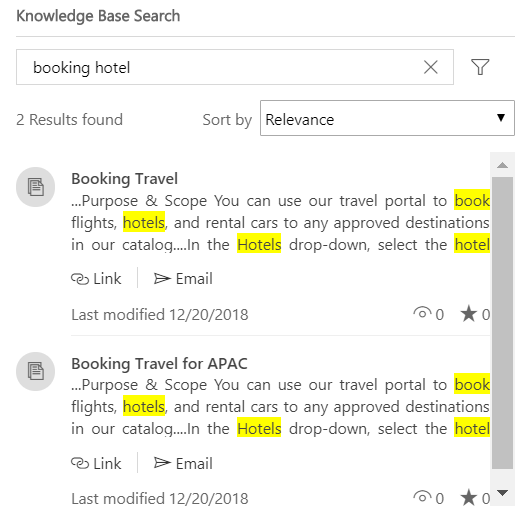 He identifies that customer is trying to book hotel in Singapore, so he modifies his search keyword to ‘book hotel in Singapore’ and gets the booking travel article specific to APAC region as the top result. key point to note here is that Singapore is not present in the ‘Booking Travel for APAC’ article’s title or content, but still this article was ranked higher compared to the other article when Bert was searching with Singapore. Contoso administrator achieved this by configuring a custom ‘country’ field in the knowledge article and enabling it for Relevance search. 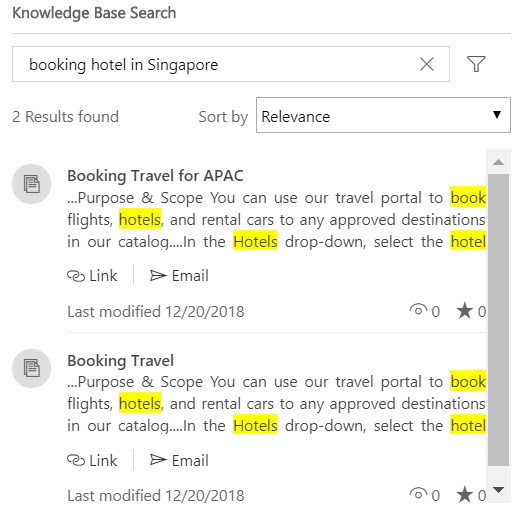 The ‘Booking Travel for APAC’ article has country field populated with Singapore, and when Bert searched for ‘book hotel in Singapore’ the match was found in the country field also, in addition to other keyword matches which were same for both the articles. Please find screenshot of this article below which has country field configured as Singapore. Contoso administrator can leverage this benefit to enable or disable search on any knowledge article field. For example, if a business requires knowledge articles to be searched only on keywords and content, but not on title, the admin can enable only keywords and content for search and disable title for search. Similarly, if a business has any custom field that captures critical information in a knowledge article, an admin can enable the custom field for search, as described in the example scenario. Relevance search can also search in notes or attachments of knowledge articles. For example, in the screenshot below, Bert got the second article in the search results because the keyword ‘book’ was found in an attachment of the ‘Support Request’ knowledge article. Bert also has feedback input that this article is shown because the result was found in attachment, as highlighted in the screenshot. Relevance search on Knowledge Base also leverages all other platform features of Relevance search like advanced scoring of search results, Microsoft natural language processing, and inflectional word matching. Since Relevance search is based on Azure indexing, you also get improved performance. Relevance search combined with KB search control’s power of delivering automatic suggestions, contextual results, filters, sorting and inline actions, helps agents resolve customer issues quickly. Refer the links below to know more about Relevance search & Knowledge Base search and to get started with enabling them in your organizations. If you are looking for more information or have any other feedback, please let us know in the comments section below.